Al-Qaeda employees organized a chain of strikes near organization’s head offices around the world, with biggest strikes being in Kabul — Afghanistan, Khartoum — Sudan, Riyadh — Saudi Arabia and Portland — USA. Low and mid level terrorists on strike demand social benefits, vacation days, trainings and salary increases. “I don’t see why we should be treated any different than an employee of say umm…corn flakes factory. We go to work every morning, very often we stay overtime, not to mention that our job is much, much more dangerous” said Mahmoud Al-Blowupi in a brief interview. “What public and Governments must realize is that we all enjoy Jihad as much as any other fundamental islamist or our leaders, but for an average Ahmed the Terrorist mountains of gold, 1000s of virgins are only to come after death, while we have families to feed, and unlike corn flakes factory worker, I have 7 wives, for Muhhamudssake” — says Bashir, 35 professional hostage facilitator. 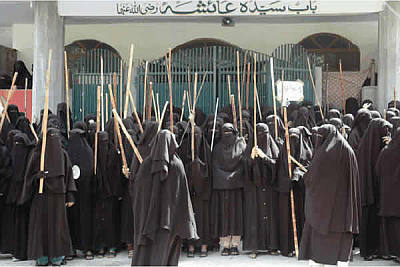 Most disgruntled employees of Al-Qaeda seem to be females from the Suicide Bombing department. Their sole demand is a more in-depth training course. Future suicide bombers say that many of their colleagues explode before reaching the destination point and in very few cases chicken out and escape, leaving the bombs in trash cans and what is even more horrifying — undetonated. Future headline-makers demand both a psychological and technical training, to avoid premature detonations and emotional breakdowns during missions. Besides, they want to feel like a valued employee of the organization, experience career growth. “I must feel that I’m growing in this organization as a professional, you know that our career is very short and we need more training than anyone else, not Al-Qaeda seems to be unwilling to invest in us” says Aisha, 22 suicide bomber rookie. Workers of Airplane Hijacking department presented their demands during recent rally. “Whenever infidels or other non-terrorist scums travel in airplanes they get this special cards that accrue bonus miles every time they fly with the same air company. We want a travel card too, we are frequent flyers and we should not be treated unequally just because we sometimes slightly modify destination of the flight” was the reply of one of rally participants. Among other requests of terrorism representatives was introduction of sick-leaves, that would allow them to leave mission in case they have a headache or ate an expired humus earlier. In case demands are not met terrorists threaten to organize a union and than blow it up. As for Al-Qaeda CEO Osama Bin Laden, we could not contact him for a comment on the situation, because we don’t know where he is. I think this should be stressed one more time: ArmComedy staff does not know where Osama Bin Laden is hiding, if we knew we would gladly share the information with FBI and carelessly spend the reward money on flamboyant purchases.